Ithaca, NY - No one tests materials for a single user! Matereality’s new collaborative framework responds to the ongoing need to disseminate data, in an exact "as viewed" form, among trusted parties. This is particularly useful when data is multivariate, requiring multiple views to aid comprehension. Matereality’s secure, collaborative features enable high-level information exchange with an easy click of a Share button, removing the tedium of creating email attachments, special Excel files, or PowerPoint documents. Collaborators receive a data link via email, inviting them to the same view, on the same platform, via a secure log-in. Data is displayed in rich detail using Matereality's Data Viewer, which provides data plotting, analytics, unit conversion, Excel export, and traceability features. For internal collaboration within the enterprise, Workgroup Material DatabasePro creates a central, private core containing material data in full interactive detail that is always available to group members, whether collocated or dispersed. All members share the same toolsets for advanced plotting accompanied by analytics to instantly compare and visualize data trends; converting units, zooming views, and interrogating curves; and exporting data to Excel, as well as in formats suited for diverse applications, including CAE. The related Collaborate app allows users to view data that they have shared with others, as well as data that others have shared with them. All of this has been released for each material database on Matereality's secure cloud, enabling the >500 companies and their engineers to share materials information in a way that suits their own business needs. 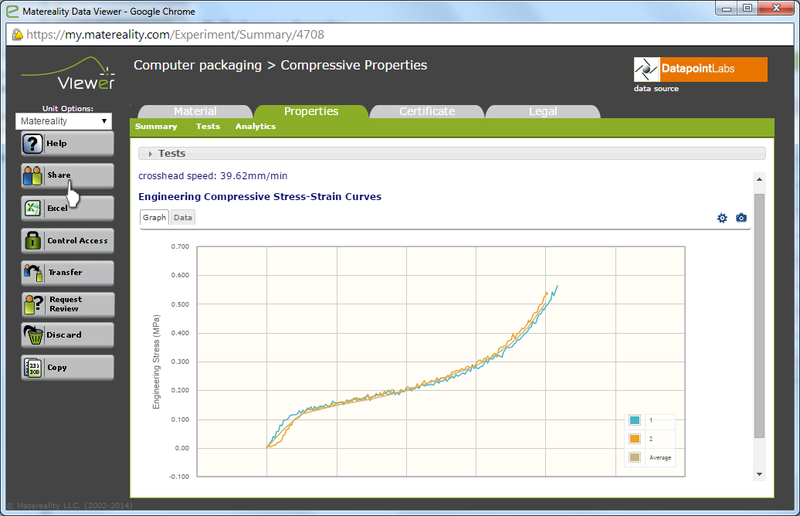 DatapointLabs (www.datapointlabs.com) is a US-based center of excellence for the measurement of material properties required for product development, CAE, and R&D. The laboratories apply scientifically rigorous techniques to provide precise characterizations of virtually any materials used in the products of today and tomorrow, including plastics, rubber, metals, composites, foams, ceramics, and even foods, in an ISO 17025 production environment. The company is a pioneer in using the latest technologies in quantitative material testing to characterize physical properties of materials in the solid and melt states, including mechanical, rheological, thermal, pvT, viscoelastic, impact, fatigue, and creep. The company delivers research-quality material data inputs for CAE in as fast as five business days for standard tests. DatapointLabs is a partner of choice to the leading CAE software vendors. Today, DatapointLabs, together with its affiliate, Matereality (www.matereality.com), offers expert material testing services and software for material data visualization, CAE material parameter conversion, and management. The goal is to provide fast, easy-to-use services that foster in-depth understanding of purpose-specific material behavior, eliminate typical risks associated with generic data, and accelerate the pace of product development.